The wild type Aequorea victoria green fluorescent protein mRNA is mis-spliced in Arabidopsis thaliana. 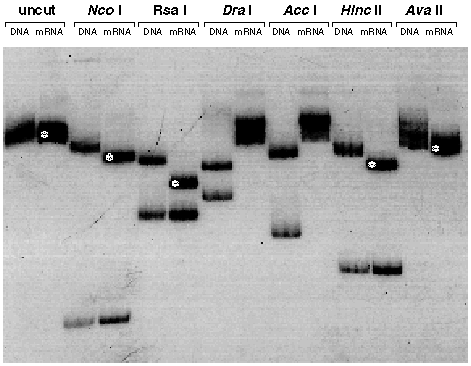 GFP sequences were amplified from DNA or mRNA isolated from transgenic Arabidopsis thaliana C24 plantlets. 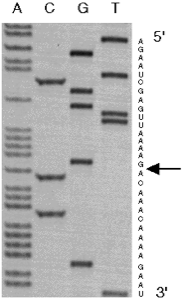 Radiolabelled products were then mapped by restriction endonuclease digestion and polyacrylamide gel electrophoresis. 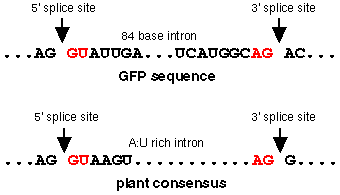 The tracks are labelled with the source of the amplified sequences (DNA or mRNA) and the name of the restriction endonuclease used for digestion, or not (uncut). Fragments that are smaller than expected have been indicated with a white asterisk. A sequence of 80-90 nucleotides (including the DraI and AccI sites) was found deleted from within the coding sequence of GFP. We subsequently showed that this sequence corresponded to a cryptic intron of 84 nucleotides (Haseloff. J. Siemering, K.R., Prasher, D. & Hodge, S. Proc. Natl. Acad. Sci. USA). Schematic diagram of the gfp coding sequence. The positions of the restriction endonuclease cleavage sites that were used for analysis of PCR products are indicated, and these are numbered according to the coding region of gfp. The cleavage pattern of the amplified gfp mRNA sequence corresponds to a deletion of 80-90 nucleotides, and this is indicated by a dark shaded region. Mis-spliced mRNA sequences were isolated from transgenic Arabidopsis tissues, and amplified using RT--PCR. The products were sequenced and an 84 nucleotide deletion was identified within the GFP coding sequence (residues 400-483). The deleted region is flanked by sequences which correspond to splice site recognition signals. The high A:U content of the GFP gene and its requirement for intron recognition in plants appears to cause very efficient mis-splicing in Arabidopsis. The cryptic intron was removed by producing a modified gfp gene with altered codon usage. See comparison between gfp and mgfp4 below. We have added a number of targeting sequences to GFP, and checked the subcellular localisation of the fusion proteins in yeast and plants. We have found that localisation of GFP to the endoplasmic reticulum is useful for routinely obtaining brightly fluorescent Arabidopsis transformants. Confocal micrographs of 35S-GFP (upper) and 35S-GFP-ER (lower) transformed cells are shown below. 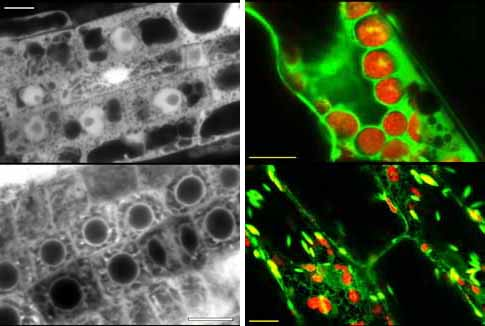 Root cells (monochrome) and shoot cells (red/green) are shown. Chloroplasts are red autofluorescent. Scale bars are 10 microns. Unmodified GFP accumulates in the nucleoplasm (but is excluded from the nucleolus) whereas ER-localised forms are contained within the endomembrane system and proplastids. ER localisation may aid the post-translational maturation of GFP, or lessen mild photoxic effects of GFP which are seen with high levels of expression. Consolidation of further improvements: the mgfp5 sequence. (4) V163A and S175G mutations produce improved GFP fluorescence. The mutations aid folding of the apoprotein and/or cyclisation of the chromophore (Siemering, K.R. Golbik, R., Sever, R. & Haseloff, J. Current Biology 6:1653-1663, 1996). (5) I167T mutation produces altered spectral properties (Heim, Prasher & Tsien PNAS 91, 12501-12504, 1994). In combination with the V163A and S175G, this mutation produces a protein with dual excitation peaks of approximately equal intensity at 400nm and 475nm (Siemering, K.R. Golbik, R., Sever, R. & Haseloff, J. Current Biology 6:1653-1663, 1996), and can be visualised well with either long wavelength UV (eg. hand-held lamp) or blue light (eg. argon laser). mGFP5-ER datasheet. Click to download. 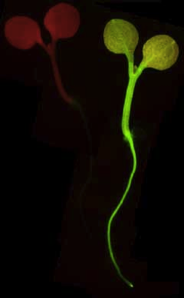 GFP can be directly visualised in transgenic Arabidopsis tissue or intact seedlings. We use a simple inverted epifluorescence microscope, equipped with a light source and filter sets suitable for long wavelength UV and blue light excitation of GFP. The use of alternate filter sets can help distinguish autofluorescence, when using dual excited variants of GFP. For routine screening, we generally use UV (380-400nm) excitation, which minimises chlorophyll red autofluorescence, and provides a useful faint blue autofluorescence in Arabidopsis roots. The growth of sterile cultures can be monitored non-invasively by epifluorescence microscopy. Wild-type and mGFP transformed Arabidopsis thaliana C24 seedlings - visualised UV epi-illumination. Note the red autofluorescence of chlorophyll in the untransformed seedling.